Maricopa wants to revitalize the Heritage District. The Heritage District is in a floodplain. The impasse that creates for homeowners wishing to improve property can be frustrating and expensive. A solution will be a long time coming. Bill and Nancy Jones live in Senita but found a 1950s house on Condrey Avenue with “tons of potential.” They discovered it on the real estate website Trulia. A victim of foreclosure, the house had been empty five years. Of course, empty is a relative term. Clearly animals and humans had made use of it. The entire quarter-acre property was full of trash. As Washington snowbirds, the Joneses are do-it-yourselfers who saw the many challenges the home presented. But they did not even know about the biggest challenge. What they knew about the property was that it was mid-century modern and had been in foreclosure. “The bank foreclosed, sent the owners the paperwork, but they never followed through, so it went to a tax sale,” Nancy Jones said. “The people we bought it from bought it on taxes, and then we bought it off of them. So there were no disclosures. They didn’t know anything about the property, and we didn’t know anything about it. Bill Jones said they hauled off 12 tons of trash from the house, the front yard and the back yard. The kitchen and bathrooms had already been stripped out. The Joneses took down all the sheetrock and plaster. That has put the brakes on all of their plans. In working with city planners on issues like setback waivers and variances, the floodplain issue came up. The Joneses were in contact with the Pinal County Flood Control District, which delivered the devastating news. Half of the value of the Condrey house is about $16,000, a fraction of what their construction improvements will be. They were able to get commercial insurance, which Bill said is $500-$600 per year. “We’re out now about $55,000, and it just keeps adding and adding and adding,” Nancy said. That’s well beyond the full value of the home, so the work automatically requires the floodplain permit. That means before they can do anything else to the house, the Joneses must do one of two things. 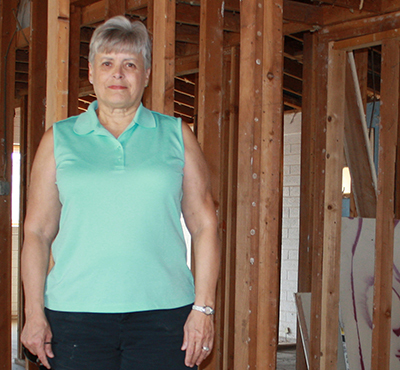 “The only thing we can do right now is get a company to come in, burrow underneath the slab, lift it up two feet, backfill it with gravel, and then put the house back down,” Nancy said. “Or tear the whole thing down. At a minimum that would cost $15,000 to $20,000. Then we have to start from scratch. For Maricopa, the option to help everyone in the Heritage District floodplain is to construct a flood-retention area or drainage project. Joshua Plumb, a floodplain manager at City Hall, said a study to do a design for drainage is more than five years away. Then any plan must get approval from Pinal County at the Federal Emergency Management Agency. His best guess is six to seven years at the earliest before Maricopa has a project. “Nobody’s taking a serious stand,” Bill Jones said. It is even a complicated situation for the city, which has property in the Heritage District it plans to develop. Plumb said an outside option is the opportunity for a development company to create its own drainage plan that meets FEMA requirements for much of the area. “We’re always looking for development,” he said. Nancy Jones said city planners were “wonderful” and very supportive of what the couple wanted to do with the house. The Heritage District Advisory Committee, too, heard their plight with compassion. “My heart goes out to you people,” committee member Renate Chamberlin said. Plumb said the city tries to inform the public about the demands of being in a floodplain. It is considered one of Maricopa’s top three issues. While a city solution for the Heritage District is a long-range goal, potential homeowners wanting to improve the oldest section of town are forewarned. “You have to know what you’re coming into,” Plumb said. 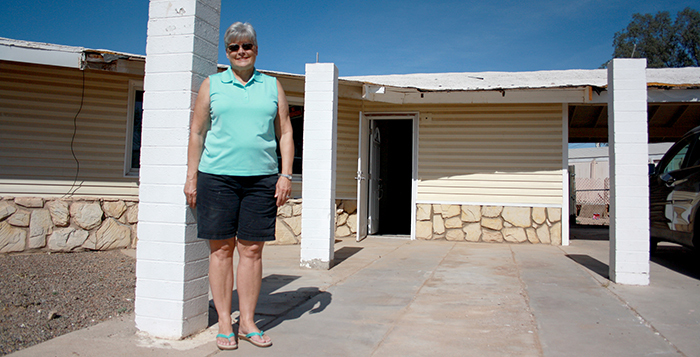 This story appeared in the April issue of InMaricopa. I believe this is incorrect when you imply that the City of Maricopa "NEEDS"" this flood retention area. This is something you "NEED" Ms Jones. You and your husband invested BLINDLY in an old house. It takes very LITTLE research to discover that OLD Maricopa (or the Heritage District) is in a flood plain. You gambles, you lost, don't blame it on anybody but yourselves. And PLEASE don't expect the Tax Payers to bail you out. You have business insurance for it (which seems a little shady at best), declare it as a BUSINESS loss and then just lick your wounds. Good Luck.